This stunningly renovated three bedroom cottage stole more than a few hearts with its sales campaign. It certainly stole my clients’ hearts… but not enough for me to be confident that we were strong contenders on auction day. The property, which was expected to go for $1.4 million to $1.55 million, is located in one of Clifton Hill’s best streets. 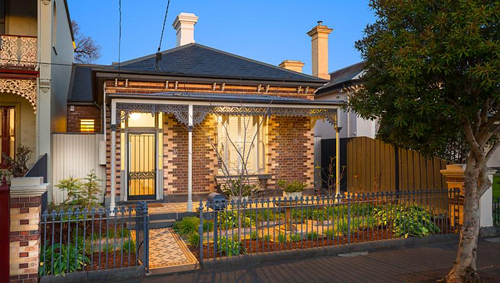 It was a magnet for media, buyer’s agents and appreciative Victorian cottage buyers. Not only that, but the agents had told us that international visitors were also keen to watch the auction unfold. I knew it would be an impressive show. What Made The Property Special? So why did this house attract so many? And why did it feature in Domain’s weekend auction coverage? 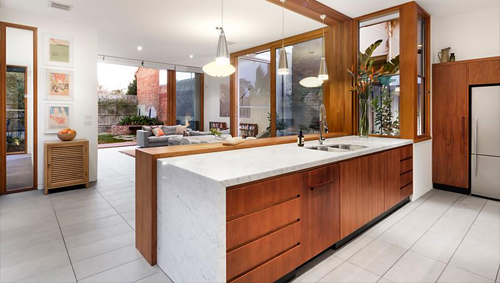 It is an utterly remarkable single-front renovation and it is located in one of Melbourne’s favourite urbane family pockets. Bounded today by Fitzroy North, Carlton, Collingwood and Northcote, Clifton Hill harbors some family magic and stunning architecture. Unusually, it is a suburb that features row after row of picturesque Victorian and Edwardian houses. While neighbouring suburbs feature flats, apartments and hints of industry, it’s fair to say that Clifton Hill offers a more homogenous blend of residential period housing, and the streetscapes reflect this. Aside from the Queens Parade shopping strip, this delightful suburb features some great local cafes and pubs, including three of my top choices: The Royal Hotel, everyone’s favourite image of what a ‘local’ encapsulates; The Bell Jar, one of my Melbourne faves for coffee and friendly fare; and Little Tony’s; a great family-friendly evening hangout for woodfired pizza. What I really admire about Clifton Hill is that it has grown into a suburb that knows its target market – urbane families. If restaurants can cater to families, if menus can feature before-6pm options and if traders can embrace toddlers and school children, they will flourish. The same can be said for residential property investments. Not only has Clifton Hill regentrified, but it is cherished by families who love the combination of city-meets-Yarra River boathouse and its impressively renovated cottages are testament to this fact. 26 Berry Street is no exception. This breathtakingly renovated brick cottage enabled singles, couples, families, upsizers, downsizers and investors to dream about the possibilities. I fell in love at the façade. The commanding entrance and hallway had me gripped and the light-filled extension which cleverly encapsulated the light was the clincher. It was obvious that this property had been beautified by a talented architect. No stone had been left unturned and the use of space was impressive. A stunning fireplace almost stole the show, yet a long study bench was hidden seamlessly behind the living area. 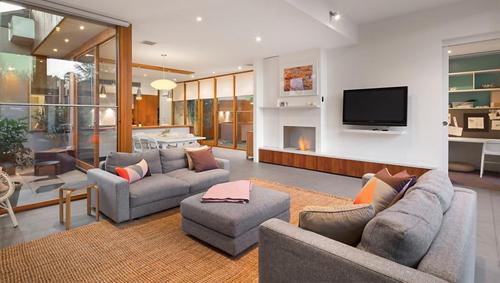 Upstairs offered one of the most beautiful single-front master bedroom plus ensuite renovations I’ve seen in the inner suburbs. From the balcony, there was an amazing view of the rooftops and treetops, while the timber blended perfectly with the downstairs open plan design. It was little surprise that one bidder fought off five other bidders (including another buyer’s advocate). This house deserved to smash the single front records – and that it did. It sold under the hammer for $1.961 million, $500,000 above this year’s record for a renovated single fronted property in the same suburb. We knew it would break hearts… but it really exceeded our expectations in terms of price. What it taught me was that a family renovation needs to cater to family well. This house, despite its single front façade, offered three generous bedrooms, a wonderful living space, a fabulous study area for business, students or working-from-home inhabitants, and a fabulously wide, tailored backyard suited to the best of BBQs and parties. The architectural renovation paid off in a big way and is a perfect example of great renovation for the right location. 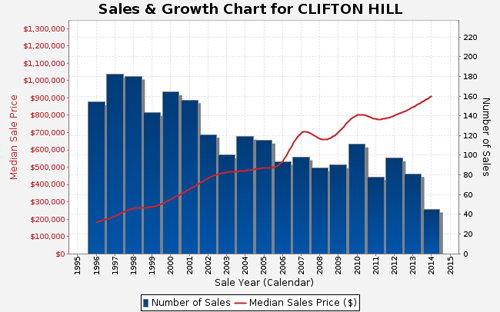 For more information about Clifton Hill, read our suburb profile here.